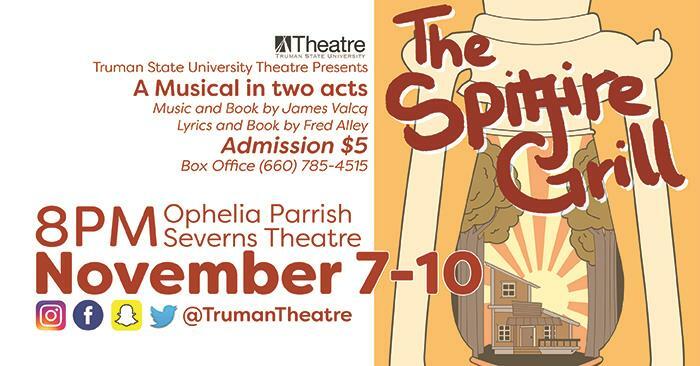 The Theatre Department will perform the musical “The Spitfire Grill” at 8 p.m. Nov. 7-10 in the James G. Severns Theatre in Ophelia Parrish. “The Spitfire Grill” combines warm and satisfying music with a touching and exhilarating story. It follows the story of Percy Talbot after she has just been released from prison after serving five years for manslaughter. She travels to the small town of Gilead after finding it in an old travel book where the local sheriff, and her parole officer, Joe Sutter finds her a job at Hannah’s Spitfire Grill. The grill is for sale, but with no interested buyers Hannah decides to raffle it off with an essay contest. Soon, mail is arriving by the wheelbarrow full and things definitely heat up at the Spitfire Grill. Based on the Award-winning movie, “The Spitfire Grill” by James Valcq and Fred Alley premiered Off Broadway in 2000. It charmed audiences with its endearing musical numbers and heartwarming characters receiving a number of critical accolades. The American Academy of Arts and Letters awarded “The Spitfire Grill” the Richard Rodgers Production Award, and it was nominated for an Outer Critics Circle Award and two Drama Desk Awards. Tickets are $5 and can be purchased in advance now until showtime 11:30 a.m.-5:30 p.m. in the Ophelia Parrish Box Office. For out of town reservations, call 660.785.4515.